MATT Ford admitted it was “a day of two halves” after recovering from a shock defeat to win the third leg of the Cuestars Seniors (40+) Tour in Bournemouth. 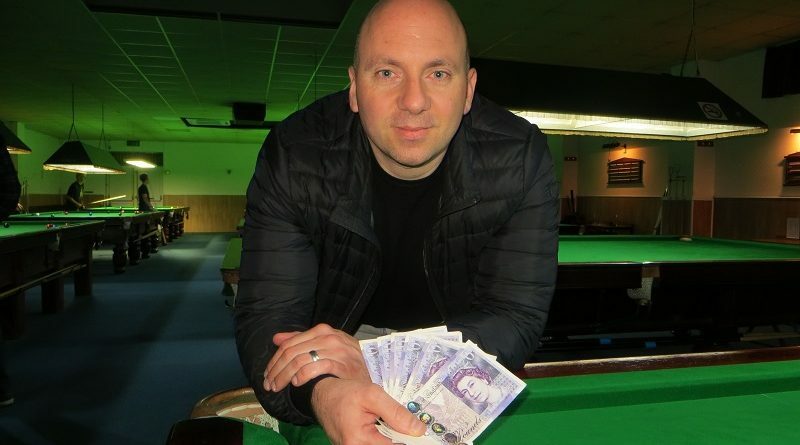 The 43-year-old from Bracknell compiled the event’s highest break of 89 to wrap up a 2-0 victory over Wayne Muddiman in the final at Greenbaize Snooker Club. Southampton-based Muddiman threatened to repeat his success over Ford in the final a year ago at the 147 SC, Swindon, by taking the lead in the opening frame with a run of 31. But the defending championship play-off winner secured the £120 first prize by responding with a 46 before nearly making a century in the second. Earlier, the World Seniors Tour player topped his round-robin group despite a surprising 2-0 defeat by Herman Desmier (Wimborne) – who celebrates his 70th birthday in three weeks. “He won fair and square,” Ford conceded. “He played very well, to be fair to him. Ford added that a highlight of the tournament that was sponsored by Parris Cues was being reunited with old friend Chris Stocker, who moved to Yeovil 18 months ago. The 29 runners, who recorded 35 breaks of 40 or more, stopped play at 11am to observe the two minutes silence to mark the centenary of the end of the First World War. Herd had laid down an early marker for the highest break with an 82 against Paul Burt (Salisbury) in the group stages. That was surpassed by rankings leader John Hunter (Andover), who was knocked out 2-0 in the last-16 by Carl Davies (Bournemouth), with an 84 against Steve Ashton (Salisbury). But then Ford went on the rampage in the knockout with seven 40-plus breaks in nine frames, including an 85 against Mike Quinnell (Bexley) and the 89 which ended with a missed tricky last red down the side cushion. Phil Morgan (Salisbury) extended his lead in the Masters (55+) rankings by qualifying for the knockout. He then lost 2-1 to Neil Jefferis (Chatham) in the last-16. Waterlooville Sports Bar hosts the fourth leg of eight on Sunday, December 9. For more information about the world-renowned Parris Cues, go to www.parriscues.com. Matt Ford: 89, 85, 77, 59, 56, 49, 46, 42, 42, 41. John Hunter: 84, 60, 40. Jon Charlton: 74, 54, 47. Franco Dezi: 58, 54, 46, 41. Nick Birney: 56, 55, 42. GROUP A: 1st, John Hunter (Salisbury SC); 2nd, Steve Ashton (Salisbury SC); 3rd, Darren Johnson (Petersfield Bowls & Snooker Club); 4th, Stephen Hills (Traders, Northfleet). GROUP B: 1st, Neil Jefferis (Ightham Club, Sevenoaks); 2nd, Jon Charlton (Aldingbourne Social Club, Chichester); 3rd, Nick Birney (Liberal Club, High Wycombe); 4th, Paul Lawrence (Park Gate RBL); 5th, John Monckton (Woking SC). GROUP C: 1st, Matt Ford (Sunninghill Comrades Club, Ascot); 2nd, Chris Rigby (Chertsey SSNR Club); 3rd, Carl Davies (St James Inst, Bournemouth); 4th, Herman Desmier (Bournemouth & District Constitutional Club); 5th, Dan Hammond (Chandlers Ford SC). GROUP D: 1st, Mike Quinnell (Bexley); 2nd, Wayne Muddiman (Chandlers Ford Central Club); 3rd, Phil Morgan (Chandlers Ford SC); 4th, Finlay Palmer (Sidcup & Foots Cray United Services Club); 5th, Neil Carroll (Chandlers Ford SC). GROUP E: 1st, Lawrence Millington (St James Inst, Bournemouth); 2nd, Neil Herd (Salisbury SC); 3rd, Adrian Frisby (Kent); 4th, Paul Burt (Salisbury SC); 5th, Richard Arnold (Salisbury SC). GROUP F: 1st, Franco Dezi (Racks, Maidenhead); 2nd, Martin Wallace (Crucible, Newbury); 3rd, James Height (Break N Dish, Street); 4th, John Meaney Old Bexley Ex-Servicemen’s Club); 5th, Chris Stocker (Sunninghill Comrades Club, Ascot). LAST-16 (10 POINTS): Davies 2-0 Hunter, Muddiman 2-0 Charlton, Rigby 2-0 Dezi, Birney 2-1 Millington, Ford 2-0 Frisby, Quinnell 2-1 Wallace, Herd 2-0 Ashton, Jefferis 2-1 Morgan. QUARTER-FINALS (12 pts, £15): Muddiman 2-1 Davies, Birney 2-1 Rigby, Ford 2-1 Quinnell, Herd 2-0 Jefferis. SEMI-FINALS (15 pts, £25): Muddiman 2-0 Birney, Ford 2-0 Herd. FINAL (25/18 pts, £120/£60): Ford 2-0 Muddiman.